A human rights advocate from Mexico will deliver Wednesday night’s Justice For Women Lecture in Portland. Maria Luisa Aguilar Rodriguez will speak on the origins and impacts of the current human rights crisis in that country and the opportunities it presents. 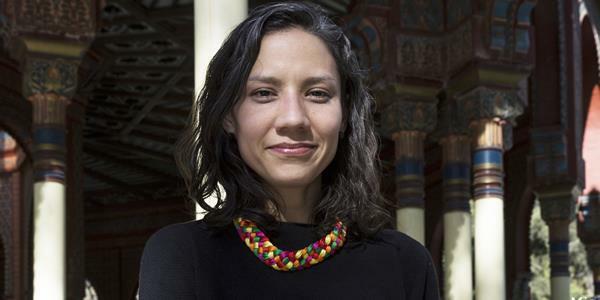 Maria Luisa Aguilar Rodriguez will speak on the origins and impacts of the current human rights crisis in Mexico and the opportunities it presents Wednesday evening at a Justice For Women event. In an interview with Nora Flaherty, Rodriguez says that Mexico's recently-elected president, Andrés Manuel López Obrador, ran on a platform of rooting out lawlessness, but she says the damage done by the failure of officials to curb the growing influence of drug cartels has been extensive. Nora Flaherty: In the past Mexico has been viewed as one of the countries in Latin America that has fairly strong institutions where people were not as vulnerable to violence, and what you're describing to me sounds like that's not really the case anymore, or at least it's less the case than it once was. What has changed in the last few years that has brought things to, what sounds like, a real crisis point? Maria Luisa Aguilar Rodriguez: Corruption and collusion. The networks of criminality touch all the aspects of the institutions, so economic power, financial power, territorial control. And that's not everywhere in Mexico. I mean I have to say that it's very — you see it in some parts, but the problem is that nobody is doing anything for those parts to become, so more and more you see that this is getting into other sectors, and that's a challenge that we'll have the future. The work that you do around around human rights in Mexico, how is the situation right now being impacted by U.S. policy? Well we see the U.S. policies impacting a lot of spectrums of human rights situations in Mexico, so we see it when the immigration policies get harder. So when you talk about militarizing the borders, we see that people still migrate, and they have to look for all their roots, where they are more vulnerable, where they are more risky for them. We see the impact when the U.S. requests cooperation from the Mexican administrations to strengthen their borders in the south, so our border in Mexico, and, basically, what happens is that you have more military forces in the border of Mexico making vulnerable, not only the migrants, but also the populations that live around it. We see impacts when you live here in the U.S. — permissions to buy assault rifles. So because there are less constraints to sell this kind of weapons in the border, then you have more trafficking into Mexico, and that goes directly to the hands of those people that are spreading violence. Part of your talk tonight is also talking about the opportunities that are arising as a result of what's going on now in Mexico. Talk a little bit to me about about what that means. I think what we see as an opportunity is that more and more there is a tension in Mexico of what impunities and how it can be addressed. The change of government, it's an important point to start. I mean, if the new president wants to continue to win elections in the middle term elections, and his party wants to to continue to be strong, they have to deliver, because the way that they were running he was saying that this was going to be over. So important cases of impunity have to be solved there. You have to have strong steps to strengthen the institutions, so to really put an implementation on where, I don't know, like just to clean up the immigration offices in Mexico that are part of all the trafficking networks that for migrants there. So things that can be seen and felt and are opportunities there. And the other thing is, and I think that's one step that the new government already did, is to acknowledge that we live in this crisis. And so more and more you see these new members of the executive power saying we live in this human rights crisis and we have to do changes. And so that's a step forward. We just need to see that the next steps. You can find more information about the University Of Maine School of Law’s annual Justice for Women lecture on their website. Ed note: this interview has been edited for time and clarity.